Launch of the Project SCORE mission on an Atlas-B rocket on Dec. 18, 1958. The first audio message to be relayed from outer space will be preserved as part of the National Recording Registry alongside Pink Floyd's "The Dark Side of the Moon," Simon and Garfunkel's "Sounds of Silence," and Chubby Checker's rendition of "The Twist," the Library of Congress announced Thursday (March 21). The space-based message, which was a recording of then-President Dwight Eisenhower conveying "America's wish for peace on Earth and goodwill toward men everywhere," was broadcast Dec. 19, 1958, from aboard the world's first communications satellite, Project Signal Communications by Orbiting Relay Equipment, or SCORE. The 30-second transmission, heard by shortwave radio as the satellite passed overhead, is one of 25 recordings that were selected by the Library of Congress because of their cultural, artistic and historic importance to the aural legacy of the United States. "Congress created the [Registry] to celebrate the richness and variety of our audio heritage," said James Billington, Librarian of Congress, in a statement. "And to underscore our responsibility for long-term preservation, to assure that legacy can be appreciated and studied for generations." 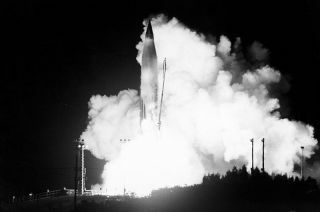 Project SCORE was not the United States' first satellite in space — that distinction goes to Explorer 1, launched on Jan. 31, 1958 — but in addition to it being the world's first communications satellite, the project also marked the first use of a missile-guidance system to steer a satellite into orbit. The Dec. 18, 1958 liftoff was the first successful use of Convair's Atlas intercontinental ballistic missile (ICBM) as a space-launch vehicle — a rocket that would later go on to lofting the first American astronauts into orbit. Project SCORE, as the first endeavor of the then newly-established Advanced Research Projects Agency (ARPA), was devised in six months under complete secrecy. Only 88 people were ever aware of Project SCORE prior to its launch, and of those, 53 were purposely misled to believe the project had been canceled before its planned liftoff. Rather than the launch vehicle deploying the satellite as a separate spacecraft, SCORE's communications package was built into the Atlas' fairing pods and the entire rocket body entered orbit. At 9,000 pounds (4080 kilograms), it was the heaviest object to circle the planet at the time. President Eisenhower recorded his message in the White House two days before it was heard relayed from space. The audio was loaded onto a tape recorder, one of two aboard SCORE, which ground stations in the southern United States could command to play back the message. Eisenhower's message was, "This is the President of the United States speaking. Through the marvels of scientific advance, my voice is coming to you via a satellite circling in outer space. My message is a simple one: Through this unique means I convey to you and all mankind, America's wish for peace on Earth and goodwill toward men everywhere." The addition of Eisenhower's Project SCORE broadcast to the National Recording Registry means more than it just being added to a list of songs and spoken word titles. The 30-second space message will now be actively preserved for future generations. The Library of Congress is identifying and preserving the best existing versions of each recording on the registry. These recordings will be housed in the Library's Packard Campus for Audio Visual Conservation in Culpeper, Va., a state-of-the-art facility that is home to more than 6 million items, including nearly 3.5 million sound recordings. After 10 years of collaborative effort and the 2010 release of the first comprehensive study on the state of recorded-sound preservation in the United States, the Library unveiled its plan last month to save the country's endangered aural legacy. This long and short-term blueprint covers the strategies for infrastructure, preservation, access, policy, and education. In addition to the Project SCORE audio and the recordings earlier identified, the 2012 selections for the registry also include the soundtrack to the 1977 John Travolta movie "Saturday Night Fever," the radio broadcast featuring Will Rogers' 1931 folksy insights in support of Herbert Hoover's nationwide unemployment relief campaign aired during the Great Depression, and The Ramones self-titled 1976 rock album. Click through to collectSPACE.com to listen to President Dwight D. Eisenhower’s Project SCORE audio message, as now a part of the National Recording Registry.